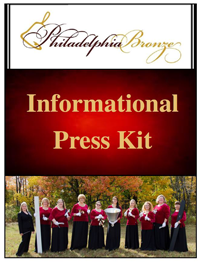 The following information and press materials are provided to the general public by Philadelphia Bronze for your use in any promotional materials you wish to create as advertizement for our concerts. All rights reserved by Philadelphia Bronze. High resolution press photos will be available soon. Please contact our Business Manager at info@philadelphiabronze.com if you have an urgent need for promotional photographs. We recognize that preparing a venue for a handbell ensemble performance can be a challenge. We have put together this press packet to assist with venue setup and configuration and to provide background information for your use in printed materials / advertisements. If you have any questions regarding the information available, please contact our Business Manager at info@philadelphiabronze.com.